The good news is that Crazy Jane has resurfaced after storming off during Cliff Steele’s ill-advised attempt at running a group therapy session for the residents of Doom Manor. The bad news is that Karen is currently in charge of her body. Karen, Rita is quick to explain to Cliff, is probably the most dangerous of Crazy Jane’s 64 personalities because she has the power to alter reality around her. The only saving grace is that Karen is entirely obsessed with romance and her power largely manifests in maintaining Karen’s self-delusions of being the heroine of her very own Rom-Com. While this is good for the world at large, it’s not that great for Karen’s quite real on-again/off-again beau, who has been dumped several times but keeps taking her back. Rita finds the whole thing irksome for the obvious reasons but also because Karen is convinced that Rita is her best friend and Rita refuses to be cast in the Judy Greer role. Not that she has a choice when Karen smiles and the whole world tries to make her happy. As Cliff and Rita try to help Jane’s other personalities retake control of Jane’s body before the inevitable happily ever after, Larry and Vic follow a call for help delivered in the form of a cake from Danny’s Cakes on Danny Street. This leads them to Danny The Street – a sentient, gender-queer, teleporting road, who has turned himself into a sanctuary for outsiders and outcasts of all stripes. The idea of a street just going wherever it wants and taking in weirdos and subversives does not sit well with Darren Jones, head of the Bureau of Normalcy – a secret government organization dedicated to stamping out anything that does not fit their cookie-cutter conservative view of what America should be (i.e. a 1950s sitcom). Danny needs help to fight the soldiers that are coming to destroy him and his friends, but Larry is convinced that his days as a hero are over… if they were ever real to begin with. 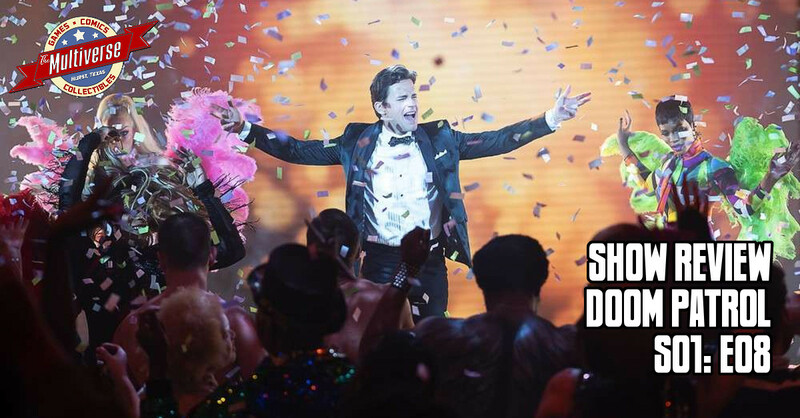 But could the power of Danny’s Perpetual Cabaret help Larry to decide who he really is with an epic musical number? Anybody who knows anything about the modern Doom Patrol comics will be familiar with the character of Danny The Street, who first approached the team for help fighting Darren Jones and the men from N.O.W.H.E.R.E. in Doom Patrol #35 and eventually became the team’s base of operations. Danny’s introduction in this episode is taken straight (if you’ll pardon the expression) from the comics, though “Danny Street” adds an additional level to the story by giving Larry Trainor a history with Darren Jones. This is not quite as forced as it might have been and is treated as a natural progression of Larry’s story, as he comes to terms with his past and his sexuality. The amazing thing about “Danny Patrol” is that the story-line involving the drag shows, musical numbers and a street that is a living, thinking being is the less busy and complicated of this week’s offerings. I’ve said before that one of the best things about Doom Patrol is watching Diane Guerrero cycle through all of Crazy Jane’s personalities and the hilarity that ensues from them bouncing off of the rest of the cast. That hilarity and unpredictably is doubled this week, as half the episode becomes devoted to parodying the tropes of pretty much every movie Julia Roberts and Meg Ryan ever starred in. There’s probably a serious, scholarly essay to be written about how this episode mocks the traditional 1990’s image of what women were meant to want while combating the 1950’s view of what men are supposed to be. I’ll let someone else do that, though. For me, it’s enough that this episode features drag queen fist-fights, stunning production values and great special effects work, that perfectly brings Danny The Street and his unique method of talking from the comics to life. Doom Patrol – Episode 8, “Danny Patrol”, airs Friday, April 5, on DC Universe.